Cysteinyl leukotrienes (CysLTs) play an important role in eosinophilic airway inflammation. In addition to their direct chemotactic effects on eosinophils, indirect effects have been reported. Eotaxin is a potent eosinophil-specific chemotactic factor produced mainly by fibroblasts. We investigated whether CysLTs augment eosinophilic inflammation via eotaxin production by fibroblasts. Leukotriene (LT)C4 alone had no effect on eotaxin production by human fetal lung fibroblasts (HFL-1). However, LTC4 stimulated eotaxin production by IL-13-treated fibroblasts, thereby indirectly inducing eosinophil sequestration. Unstimulated fibroblasts did not respond to LTC4, but coincubation or preincubation of fibroblasts with IL-13 altered the response to LTC4. To examine the mechanism(s) involved, the expression of CysLT1R in HFL-1 was investigated by quantitative real-time PCR and flow cytometry. Only low levels of CysLT1R mRNA and no CysLT1R protein were expressed in unstimulated HFL-1. In contrast, stimulation with IL-13 at a concentration of 10 ng/ml for 24 h significantly up-regulated both CysLT1R mRNA and protein expression in HFL-1. 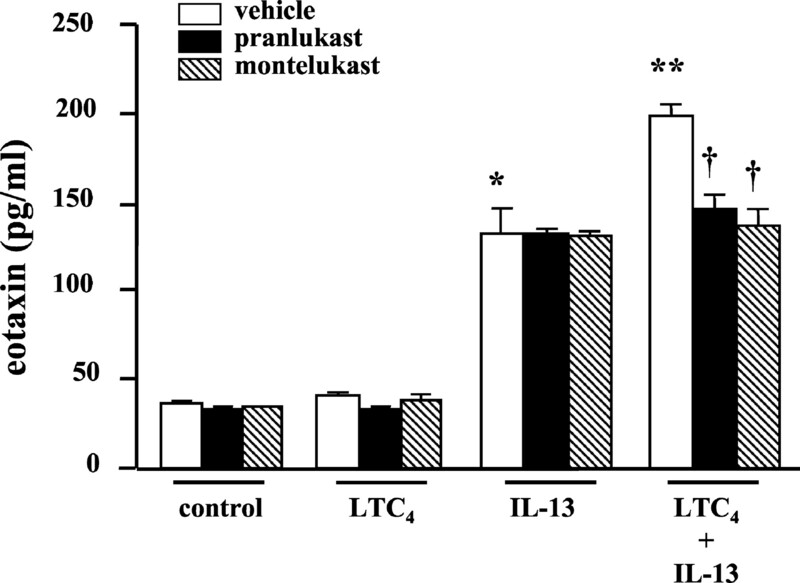 The synergistic effect of LTC4 and IL-13 on eotaxin production was abolished by CysLT1R antagonists pranlukast and montelukast. These findings suggest that IL-13 up-regulates CysLT1R expression, which may contribute to the synergistic effect of LTC4 and IL-13 on eotaxin production by lung fibroblasts. In the Th2 cytokine-rich milieu, such as that in bronchial asthma, CysLT1R expression on fibroblasts might be up-regulated, thereby allowing CysLTs to act effectively and increase eosinophilic inflammation. Cysteinyl leukotrienes (CysLTs)2 such as leukotriene (LT)C4, LTD4, and LTE4 are multipotential lipid mediators implicated mainly in the pathogenesis of airway inflammation and related phenomena, such as bronchoconstriction, mucus secretion, and airway hyperresponsiveness (1, 2, 3, 4). Substantial evidence suggests that CysLTs play an important role in eosinophilic airway inflammation. Intratracheal administration of LTD4 promotes eosinophil sequestration into the airways (5, 6). CysLTR antagonists reduce eosinophilic inflammation of the airways in asthma (7, 8). The role of CysLTs in eosinophilic inflammation has been studied in several in vitro experiments. Spada et al. (9) reported that LTD4 has a direct chemotactic effect on eosinophils. Incubation of eosinophils in agarose gel in the presence of a chemotactic LTD4 gradient has been shown to cause eosinophil chemotaxis, which is inhibited by the addition of a specific LTR antagonist (LTRA). LTRA can also inhibit platelet-activating factor-induced eosinophil transmigration through monolayers of cultured HUVECs (10). In addition to direct effects, indirect effects of CysLTs on eosinophils have been reported. PBMCs isolated from patients with asthma produce IL-5 in response to stimulation with mite Ag. CysLTs may induce IL-5 production resulting in an eosinophil influx, which can be prevented by treatment with LTRA or anti-IL-5 Ab (11). Eotaxin is a potent eosinophil-specific chemotactic factor that plays a central role in eosinophilic airway inflammation in asthma (12). Recently, lung fibroblasts have been reported to produce eotaxin, and their activation can be modulated by inflammatory cytokines such as IL-4 and IL-13 (13, 14, 15, 16, 17). Little is known about the response of fibroblasts to CysLTs and the expression of CysLT1R on fibroblasts. The in situ hybridization pattern of CysLT1R in normal human lung is characterized by strict localization to smooth muscle cells (SMC) and some macrophages (18). Thivierge et al. (19) showed that Th2 cytokines such as IL-4, IL-5, and IL-13 have a regulatory role in CysLT1R expression in monocytes/macrophages (20) or HL-60 cells. We hypothesized that CysLTs augment eosinophil inflammation via eotaxin production by fibroblasts. To examine this hypothesis, we investigated whether LTC4, alone or in combination with IL-13, can stimulate eotaxin production by fibroblasts. Furthermore, we examined whether IL-13 up-regulates CysLT1R expression in fibroblasts. Human rIL-13 and anti-eotaxin neutralizing Ab were obtained from R&D Systems (Minneapolis, MN). LTC4, LTD4, and rabbit polyclonal anti-human CysLT1R Ab were purchased from Cayman Chemicals (Ann Arbor, MI). Rabbit IgG isotype and DAKO IntraStain kits were obtained from DAKO (Copenhagen, Denmark). The LTRAs pranlukast and montelukast were gifts from Ono Pharmaceutical (Osaka, Japan) and Merck (Whitehouse Station, NJ), respectively. Eotaxin ELISA kits were purchased from BioSource International (Camarillo, CA). Human fetal lung fibroblasts (HFL-1; lung, diploid, human, passage 7–12 cell line) were obtained from the American Type Culture Collection (Manassas, VA). The HFL-1 cells were seeded in 12-well tissue culture plates at a density of 5 × 104 cells/ml and cultured at 37°C in a 5% CO2-humidified incubator in Ham’s F12K medium (Sigma-Aldrich, St. Louis, MO), containing 10% heat-inactivated FBS, until confluence. The medium was then replaced with FBS-free F12K, and the cells were stimulated with IL-13 and LTC4 or LTD4 in the presence or absence of LTRA (pranlukast or montelukast). Human bronchial SMC were obtained from BioWhittaker (Walkersville, MD) and cultured in SmGM-2 medium. Human alveolar macrophages (AM) were obtained from healthy volunteers by means of bronchoalveolar lavage (BAL). The concentrations of eotaxin were measured in the cell supernatant fluids from HFL-1 cells using an ELISA kit (BioSource International) according to the manufacturer’s instructions. The minimum concentration detected by this method was 2 pg/ml. Eosinophils were isolated from 60 to 80 ml of peripheral venous blood obtained from healthy donors by means of a magnetic cell separation system (MACS; Miltenyi Biotec, Bergisch-Gladbach, Germany) as described by Hansel et al. (21). Venous heparinized blood was diluted 1/1 in PBS before being loaded on 67% Percoll (density, 1.077 g/ml). After centrifugation at 800 × g for 30 min, mononuclear cells were removed, and the erythrocytes in the cell pellet were hypotonically lysed for 60 s. The polymorphonuclear leukocytes thus obtained were incubated for 1 h at 4°C with anti-CD16 beads, and the suspension was placed in a MACS column for final separation. The purity of eosinophils was generally >98%, and the viability was >95%, as judged by trypan blue exclusion. Eosinophils were suspended in RPMI 1640 containing 10% FBS. Total RNA was extracted with the use of TRIzol reagent (Life Technologies, Frederick, MD) from HFL-1 cells cultured in 6-well tissue culture plates. The total RNA was reverse transcribed with a ThermoScript RT-PCR System (Life Technologies) according to the manufacturer’s protocol. PCR were performed with a thermal cycler (Takara Bio, Ohtsu, Japan) under the following conditions: 1 cycle at 94°C for 5 min, followed by 30–36 cycles consisting of 1 min denaturation at 94°C, 1 min annealing at 60°C, and 2 min extension at 72°C. The last cycle was extended to 5 min at 72°C. Products were analyzed by 2% (w/v) agarose gel electrophoresis. The sequences of the 5′ sense primers and the 3′ antisense primers synthesized based on published sequence data (22) and used in this study were as follows: CysLT1R, sense, 5′-GACAGCCATGAGCTTTTTCC-3′, and antisense, 5′-ATGCACCCAGAGACAAGGTT-3′ (product size, 514 bp); and β-actin, sense, 5′-AAGAGAGGCATCCTCACCCT-3′, and antisense, 5′-TACATGGCTGGGGTGTTGAA-3′ (product size, 234 bp). Reverse transcription was performed using 1 μg of total RNA and oligo(dT) primers in a 20-μl reaction according to the manufacturer’s protocol (PE Applied Biosystems, Foster City, CA). CysLT1R primers and β-actin primers were designed using Primer Express software (PE Applied Biosystems). The following are sequences for CysLT1R and β-actin: forward primer, 5′-GCACCTATGCTTTGTATGTCAACC-3′; reverse primer, 5′-ATACCTACACACACAAACCTGGC-3′; forward primer, 5′-AAGAGAGGCATCCTCACCCT-3′; and reverse primer, 5′-TACATGGCTGGGGTGTTGAA-3′. Real-time PCR was performed on the ABI Prism 7700 sequence detection system (PE Applied Biosystems) by using SYBR green (Roche Diagnostics, Somerville, NJ) as a dsDNA-specific binding dye. The PCR were cycled 40 times after initial denaturation (95°C, 2 min) with the following parameters: denaturation, 95°C, 15s; and annealing and extension, 60°C, 1 min. The threshold cycle (CT) was recorded for each sample to reflect the mRNA expression levels. A validation experiment proved the linear dependence of the CT value for both CysLT1R and β-actin concentration and consistency of ΔCT (CysLT1R average CT − β-actin average CT) in a given sample at different RNA concentration. Therefore, ΔCT was used to reflect the relative CysLT1 expression levels. To determine the effects of different stimuli on CysLT1R gene expression as compared with unstimulated cells, ΔΔCT was calculated (ΔΔCT = ΔCT stimulus − ΔCT nonstimulated cells). CysLT1R mRNA was indexed to the β-actin using the following formula: 1/(2ΔCT) × 100%. The value of 2ΔΔCT was calculated to demonstrate the fold changes of CysLT1R gene expression in stimulated cells as compared with unstimulated cells. The expression of CysLT1R on HFL-1 was analyzed by flow cytometry as described by Thivierge et al. (20). Cells were washed with PBS and fixed in 2% paraformaldehyde for 15 min at room temperature, followed by permeabilization with DAKO IntraStain reagent B for 15 min at room temperature. Cells were resuspended with PBS and labeled with anti-CysLT1R Ab (1:1000) or isotype control Ab for 60 min at 4°C. After washing with cold PBS, the cells were incubated with FITC-conjugated goat anti-rabbit IgG F(ab′)2 (Rockland, Gilbertsville, PA) for 60 min at 4°C. Finally, the cells were washed again and resuspended in PBS. Single-color immunofluorescence analysis of 5000 cells was performed on a FACScan flow cytometer (BD Biosciences, San Jose, CA). Chemotaxis assays were performed with the use of a 96-well microchemotaxis chamber (NeuroProbe, Bethesda, MD). Medium alone (negative control) or cell supernatant fluid from HFL-1 cells (37 μl) was added to individual wells of the bottom plate. A polyvinylpyrrolidone-free polycarbonate framed filter (5-μm pore size) was placed onto the filled bottom plate. The silicon gasket and the upper pieces of the chamber were applied, and 50 μl of the eosinophil suspension (2 × 106 cells/ml in F12K) was placed into the upper chambers on top of the membrane (at least n = 3 wells/condition). After 90 min of incubation in humidified air with 5% CO2 at 37°C, the filter was fixed in methanol and stained with Diff-Quik. Nonmigrated cells on the upper side of filter were wiped away with a cotton swab and rinsed with PBS. Eosinophil chemotaxis activity was expressed as the total number of migrated eosinophils counted in 10 high-power fields under a light microscope at ×400 magnification. Data are expressed as means ± SEM. Statistical significance was determined by one-way ANOVA or paired t test. A value of p < 0.05 was considered to indicate statistical significance. HFL-1 produced a small amount of eotaxin in the culture supernatant spontaneously without stimulation for 48 h. LTC4 alone at concentration from 10−12–10−6 M did not increase the production of eotaxin as compared with control (Fig. 1⇓A). 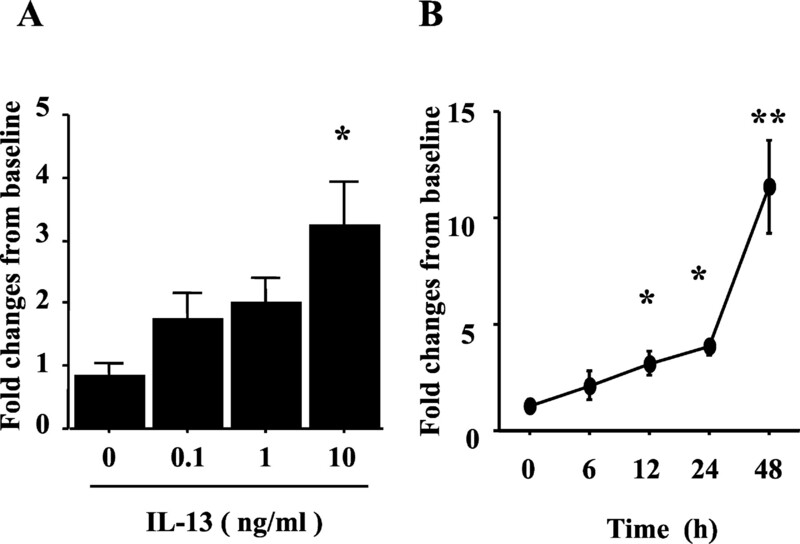 In contrast, IL-13 increased eotaxin production in a concentration-dependent manner (Fig. 1⇓B). 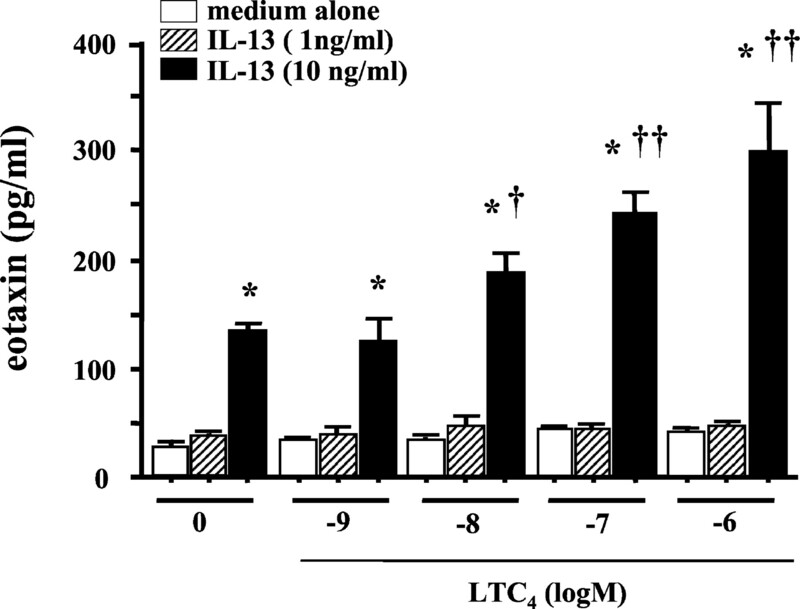 The effect of 10 ng/ml IL-13 was significantly augmented by LTC4 in a concentration-dependent manner (Fig. 2⇓). 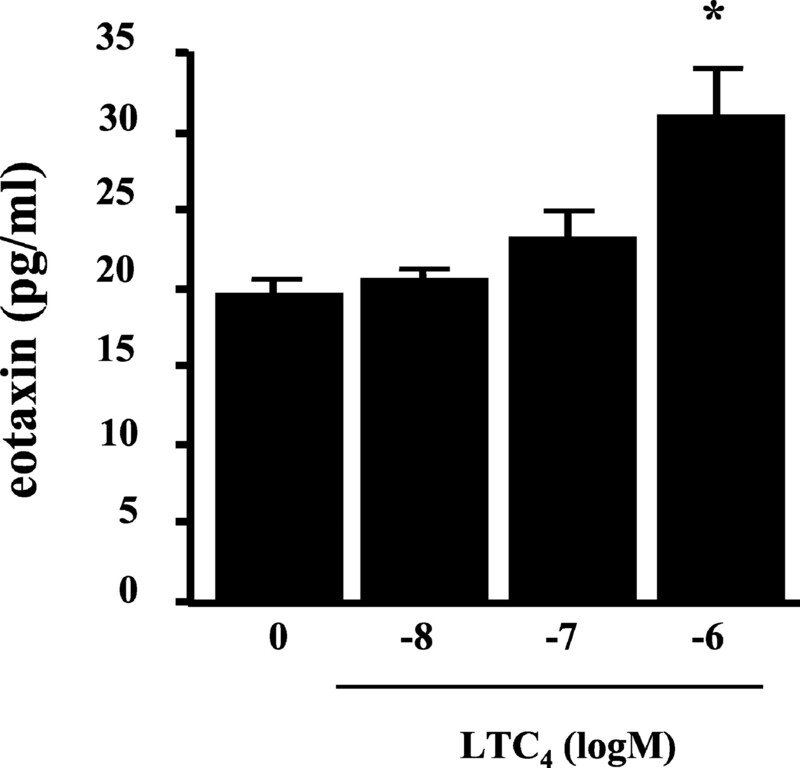 This synergistic effect of LTC4 (10−7 M) and IL-13 (10 ng/ml) on eotaxin production was suppressed by planlukast and montelukast at a concentration of 10−6 M (Fig. 3⇓). These two LTRAs showed almost equal inhibitory effects. As well as LTC4, LTD4, which alone had no direct effect on fibroblasts, also augmented IL-13-induced eotaxin production. The effect of LTD4 was approximately the same degree as LTC4 and inhibited by LTRAs (data not shown). Eotaxin production by HFL-1 in response to treatment with LTC4 (A) or IL-13 (B). HFL-1 cells were cultured with various concentrations of LTC4 or IL-13 for 48 h, and eotaxin concentrations in the culture supernatant were measured. Data are means ± SEM (n = 4). ∗, p < 0.0001 vs untreated cells. 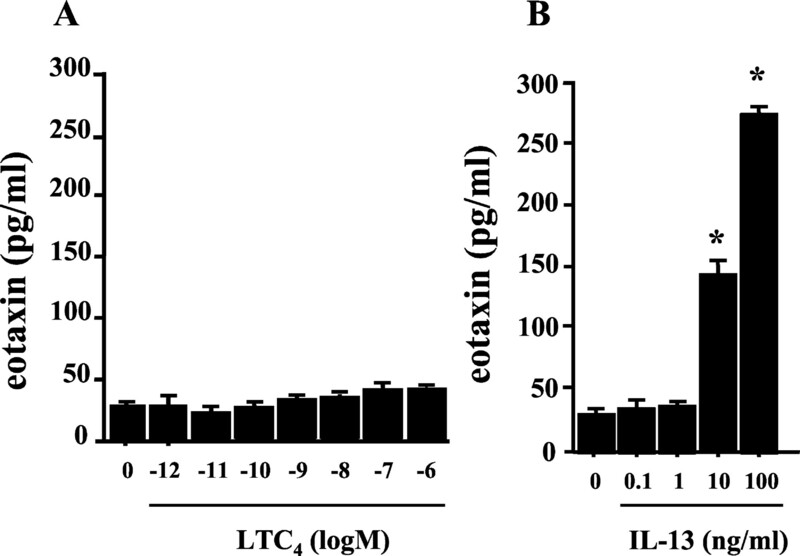 Synergistic effects of LTC4 and IL-13 on eotaxin production by HFL-1. HFL-1 cells were cultured with LTC4 and IL-13 for 48 h. Then eotaxin concentrations in the culture supernatant were measured. Data are means ± SEM (n = 3–9). ∗, p < 0.0001 vs medium alone; †, p < 0.001, and ††, p < 0.0001 vs IL-13 (10 ng/ml) without LTC4. Inhibitory effect of the LTRAs on eotaxin production. Pranlukast or montelukast (10−6 M) was added into culture supernatant with LTC4 (10−7 M) and IL-13 (10 ng/ml). HFL-1 cells were cultured with LTC4 and IL-13 for 48 h. Then eotaxin concentrations in the culture supernatant were measured. Data are means ± SEM (n = 4). ∗, p < 0.0001 vs medium alone; ∗∗, p < 0.001 vs IL-13; and †, p < 0.001 vs IL-13 with LTC4. To determine whether the observed synergy between LTC4 and IL-13 depends on the priming of HFL-1 by IL-13, we examined the effect of LTC4 on eotaxin production by HFL-1 previously stimulated with IL-13. After preincubation of HFL-1 with 10 ng/ml IL-13 for 24 h, cells were washed twice and further cultured for 24 h in the presence or absence of various concentrations of LTC4. HFL-1 prestimulated with 10 ng/ml IL-13 could respond to LTC4, and eotaxin production was increased in an LTC4 concentration-dependent manner (Fig. 4⇓). These results suggest that IL-13 can alter the response of HFL-1 to LTC4. 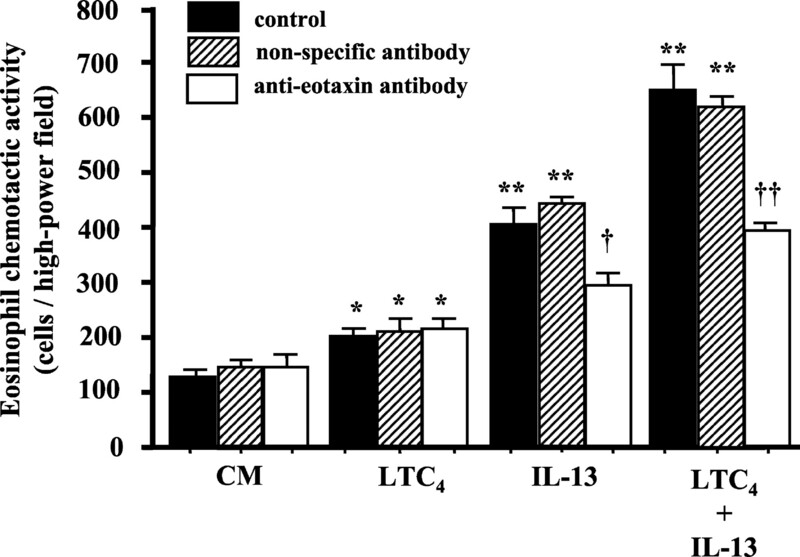 Effect of LTC4 on eotaxin production by HFL-1 previously stimulated with IL-13. After preincubation of HFL-1 with 10 ng/ml IL-13 for 24 h, the cells were washed twice and further cultured for 24 h in the presence or absence of various concentrations of LTC4. Data are means ± SEM (n = 4). ∗, p < 0.01 vs untreated cells. To investigate the mechanism of increased responsiveness of HFL-1 to LTC4, the expression of CysLT1R mRNA on HFL-1 was examined by semiquantitative RT-PCR. Unstimulated HFL-1 expressed only low levels of CysLT1R mRNA as compared with the expression levels in human AM or human bronchial SMC (Fig. 5⇓). Both AM and SMC have been reported to express CysLT1R constitutively (23). Real-time PCR revealed that stimulation with IL-13 at a concentration of 10 ng/ml for 24 h significantly up-regulated CysLT1R mRNA expression in HFL-1 (Fig. 6⇓A). This effect of IL-13 was time dependent by 48 h (Fig. 6⇓B). CysLT1R mRNA expression on HFL-1 cells. The expression of CysLT1R mRNA was investigated by means of semiquantitative RT-PCR. Unstimulated HFL-1 expressed only low levels of CysLT1R mRNA as compared with the expression levels in human AM or human bronchial SMC. A, Results of a single experiment, representative of at least four, are shown. 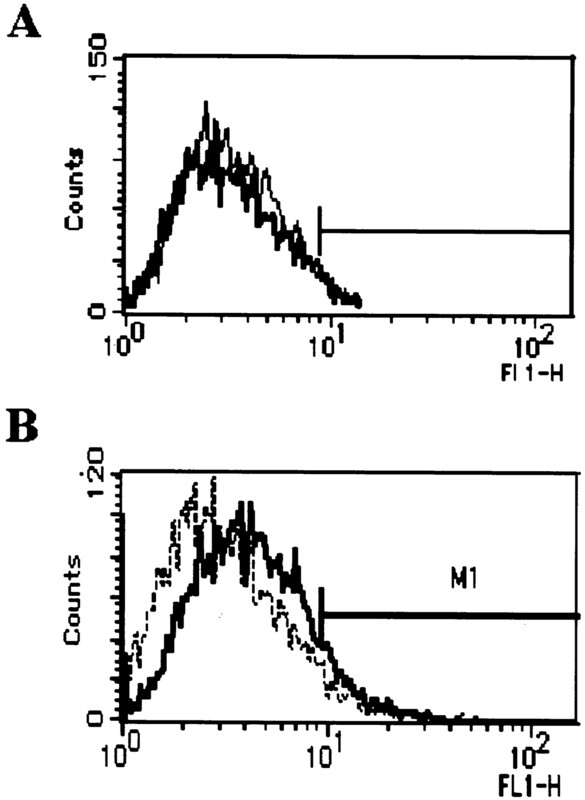 B, The ratio of CysLT1R mRNA to β-actin mRNA was determined with a densitometer. Data are means ± SEM (n = 4). ∗, p < 0.05; ∗∗, p < 0.01 vs HFL-1. 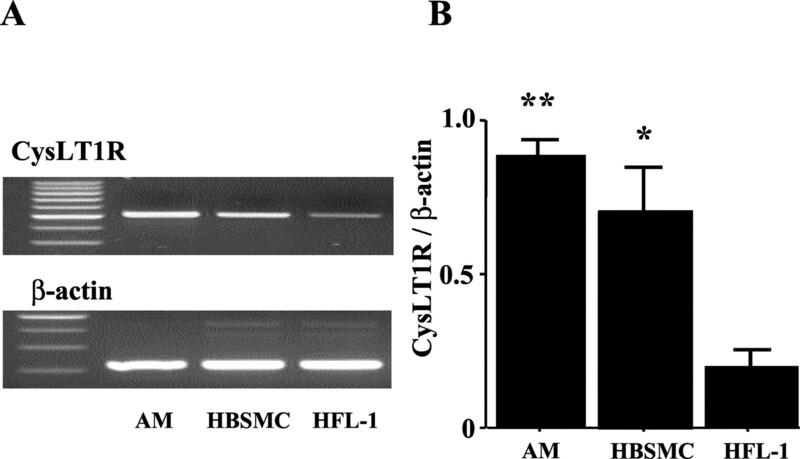 Effect of IL-13 on CysLT1R mRNA expression on HFL-1 cells. The cells were incubated with various concentrations of IL-13 from 6 to 48 h and mRNA expression was analyzed by real-time PCR. A, Concentration-dependent effects of IL-13. Data are means ± SEM (n = 4). ∗, p < 0.05 vs untreated cells. B, Time-dependent effects of IL-13 (10 ng/ml). Data are means ± SEM (n = 6). ∗, p < 0.05; ∗∗, p < 0.01 vs untreated cells. To test whether transcription of CysLT1R mRNA is associated with augmented cellular expression of CysLT1R protein, flow cytometry analysis was performed with the use of a specific anti-CysLT1R Ab. Changes in HFL-1 mRNA levels were paralleled by increased cellular expression of CysLT1R. Only IL-13 at a concentration of 10 ng/ml significantly up-regulated CysLT1R protein expression (Fig. 7⇓). In contrast, no expression of CysLT1R protein was detected on unstimulated cells or cells stimulated with 1 ng/ml IL-13. Flow cytometric analysis of CysLT1R expression. CysLT1R expression was determined after incubation with various concentrations of IL-13 for 24 h. A, Dotted lines represent untreated cells labeled with isotype control Ab, and solid lines represent untreated cells (medium alone) labeled with anti-CysLT1R Ab. B, Dotted lines represent untreated cells labeled with isotype control Ab, and solid lines represent IL-13 (10 ng/ml)-treated cells labeled with anti-CysLT1R Ab. To determine whether LTC4-induced eosinophil sequestration is attributed to LTC4 itself or to eosinophil chemotactic factors, including eotaxin produced by fibroblasts stimulated by LTC4, eosinophil chemotactic activity in the culture supernatant was evaluated with the use of anti-eotaxin Ab and a CysLT1R antagonist, pranlukast. Culture supernatant from HFL-1 stimulated with LTC4 had higher eosinophil chemotactic activity than did unstimulated control supernatant, and this increased chemotactic activity was abolished by the treatment of HFL-1 with pranlukast (Fig. 8⇓A). Because LTC4 added to the fresh medium showed equivalent chemotactic activity to that of the culture supernatant of HFL-1 stimulated with LTC4, and the direct chemotactic effect of LTC4 on eosinophils was inhibited by pranlukast (Fig. 8⇓B), LTC4 was considered to directly possess chemotactic activity. A combination of LTC4 (10−7 M) and IL-13 (10 ng/ml) showed greater eosinophil chemotactic activity than did either LTC4 or IL-13 alone (Fig. 8⇓A). 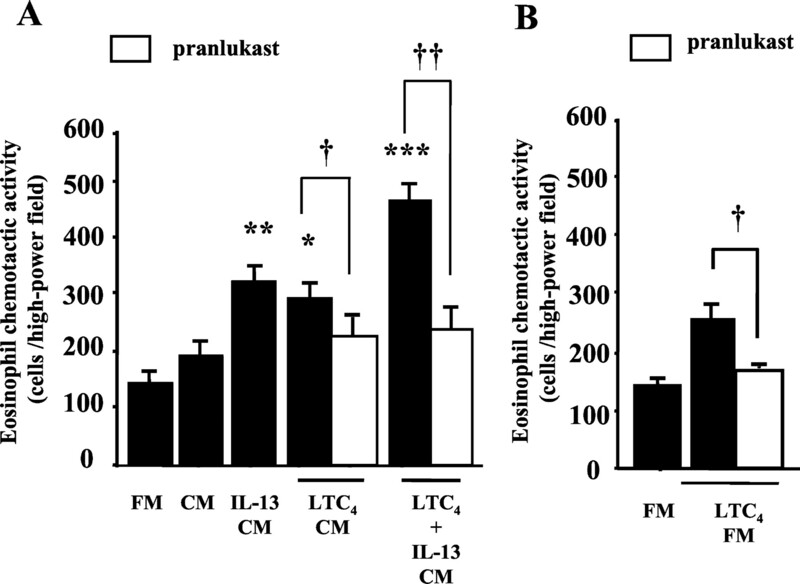 Treatment of HFL-1 with pranlukast inhibited the eosinophil chemotactic activity induced by the combination of LTC4 (10−7 M) and IL-13 (10 ng/ml) (Fig. 8⇓A). In this case, pranlukast was considered to be effective both in inhibition of eosinophil migration to LTC4 and in inhibition of eotaxin production from HFL-1. Eosinophil chemotactic activity in conditioned medium (A) and fresh medium with LTC4 (B). Pranlukast (10−6 M) was added into the culture medium before cells were stimulated with LTC4 and/or IL-13 in case of conditioned medium (CM). Meanwhile, pranlukast was added into the fresh medium (FM) containing LTC4 in B. Data are expressed as means ± SEM (n = 4). ∗, p < 0.05; ∗∗, p < 0.01; and ∗∗∗, p < 0.001 vs CM. †, p < 0.01; and ††, p < 0.0001. Furthermore, the addition of anti-eotaxin Ab significantly decreased eosinophil chemotactic activity induced by IL-13 alone or by a combination of LTC4 and IL-13 (Fig. 9⇓). Nonspecific Ab had no effect on eosinophil chemotactic activity. These findings suggest that, in addition to its own chemotactic effect, LTC4 can augment eotaxin production by fibroblasts stimulated with IL-13, thereby inducing eosinophil migration. Effect of anti-eotaxin Ab and nonspecific Ab on eosinophil chemotactic activity in culture supernatant of HFL-1 stimulated with LTC4 and IL-13. Data are expressed as means ± SEM (n = 4). ∗, p < 0.05; ∗∗, p < 0.001 vs CM control. †, p < 0.01 vs IL-13 control; and ††, p < 0.001 vs LTC4 plus IL-13 control. Our study clearly showed that LTC4 plays an important role in the pathogenesis of eosinophilic inflammation in vitro. LTC4 alone had weak chemotactic activity for eosinophils, consistent with previous reports (9). In addition to the direct effect of LTC4, we showed that LTC4 could stimulate eotaxin production by IL-13-treated fibroblasts, thereby indirectly inducing eosinophil sequestration. Whereas unstimulated fibroblasts did not respond to LTC4, coincubation or preincubation with IL-13 altered the response of fibroblasts to LTC4. HFL-1 stimulated with IL-13 responded to LTC4 and produced eotaxin. Such production was inhibited by the CysLT1R antagonists. We investigated the mechanism of the IL-13-induced increase in HFL-1 responsiveness to LTC4. Unstimulated HFL-1 constitutively expressed low levels of CysLT1R mRNA as compared with levels expressed by human bronchial SMC or AM. IL-13 induced CysLT1R expression at both the transcript and protein levels. This up-regulation of CysLT1R expression by IL-13 was considered responsible for the effect of LTC4 on eotaxin production by HFL-1. Recently, Lynch et al. (18) reported the cloning and characterization of high-affinity cell surface LTD4R (CysLT1R). Expression of CysLT1R mRNA has been identified in bronchial SMC, macrophages, and peripheral blood leukocytes (18, 23). However, to our knowledge, no study has examined CysLT1R expression in fibroblasts. Therefore, we believe that this is the first report describing CysLT1R expression in fibroblasts and regulation of such expression by IL-13. Lynch et al. (18) reported that the in situ hybridization pattern of CysLT1R in normal human lung is characterized by strict localization to SMC and some macrophages. Although the expression of CysLT1R in patients with bronchial asthma remains unclear, fibroblasts might express CysLT1R in the Th2 cytokine-rich milieu. Several previous reports have examined the regulation of CysLT1R expression. Thivierge et al. (19) showed that IL-5 up-regulates CysLT1R expression and enhances responsiveness to LTD4 in HL-60 cells. They also reported that IL-13 and IL-4 enhance the expression of CysLT1R in monocytes/macrophages (20). These findings suggest that Th2 cytokines, including IL-4, IL-5, and IL-13, have a regulatory role in CysLT1R expression. In our study, IL-13 up-regulated CysLT1R expression on fibroblasts. The inflammatory process associated with asthma is thought to be mediated by Th2 lymphocytes and their cytokines. Elevated expression of IL-13 mRNA and protein has been observed in BAL cells of patients with atopic asthma after allergen challenge (24). In a Th2 cytokine-rich environment, CysLT1R expression on fibroblasts is thought to be up-regulated, promoting the proinflammatory effects of CysLTs. In practice, inhaled LTD4 or LTE4 has been shown to induce airway eosinophilia in asthmatic subjects (6, 25). However, there is no report about the effect of CysLTs on eosinophilic airway inflammation in nonallergic subjects. In an animal study, LTD4 inhalation did not induce eosinophil sequestration into airway in control nonallergic mice. Conversely, eosinophil airway inflammation was not induced in 5-lipoxygenase knockout mice, even though an asthmatic state was made by OVA sensitization and challenge. However, LTD4 inhalation replenished eosinophil sequestration in 5-lipoxygenase knockout mice to the level of wild-type allergic mice (26). These findings suggest that both Th2 cytokines and CysLTs are essential for eosinophilic inflammation, and they also support our results that LTC4 alone stimulated no eotaxin production but it could induce eotaxin production with IL-13. Eotaxin is a C-C chemokine that has potent and specific chemotactic activity for eosinophils (27, 28, 29, 30). Eotaxin plays an important part in the pathophysiology of eosinophilic airway inflammation. A variety of cell types are responsible for eotaxin production, including macrophages, T lymphocytes, bronchial epithelial cells, endothelial cells, and fibroblasts (31, 32, 33, 34, 35). However, fibroblasts are considered the major source of eotaxin (34, 35, 36). Recently, IL-4 and TNF-α were reported to synergistically promote the secretion of eotaxin in human skin and nasal fibroblasts (14, 34). IL-13 shares many biological properties with IL-4 and has similar effects in human airway epithelial cells (37, 38) and fibroblasts (17). Synergism between IL-4 and TNF-α is ascribed to the finding that transcription factor STAT-6 activated by IL-4 signals and NF-κB activated by TNF-α stimulation bind to an overlapping binding site on the eotaxin promoter proximal region, thereby amplifying response (39). In our study, STAT-6-dependent pathways were also presumably involved in the IL-13-induced up-regulation of CysLT1R expression. The synergistic effect of IL-13 and LTC4 might not involve a CysLT1R-dependent mechanism. Recently, Panettieri et al. (40) reported that LTD4 augments proliferation of human airway smooth muscle induced by epidermal growth factor (EGF). The precise mechanism underlying this synergy is unknown, but can be explained by convergence between LTD4 signals via a G protein-coupled receptor and EGF signals via an EGFR tyrosine kinase. Such signal convergence might participate in the synergism between IL-13 and LTD4, but this possibility is unlikely, because our study showed that eotaxin production was increased not only by simultaneous stimulation with LTC4 and IL-13 but also by stimulation with LTC4 alone after 24-h pretreatment with IL-13. Pranlukast and montelukast are specific LTRAs that can inhibit CysLT-induced bronchospasm. Recent studies have demonstrated that a single exposure of guinea pigs to aerosolized LTD4 produces a significant accumulation of eosinophils in the lung and BAL fluid, which persists for at least 4 wk after challenge. Pranlukast significantly inhibited both the bronchoconstriction and the immediate (24 h) and sustained (4 wk) eosinophil influx into the airways (41). Pranlukast also reduces infiltration of inflammatory cells, including eosinophils, in the bronchial mucosa of patients with asthma (42). In the present study, LTRAs inhibited LTC4-induced eotaxin production by fibroblasts and reduced eosinophil migration. These findings support the therapeutic usefulness of LTRA for eosinophilic inflammation. In conclusion, we have shown that IL-13 synergistically augmented eotaxin production by LTC4 via up-regulation of CysLT1R expression on lung fibroblasts and that a CysLT1R antagonist can suppress eosinophilic recruitment to the airway through both direct and indirect mechanisms. We thank Kiyoko Abe and Yasuko Nonaka for their excellent technical assistance. ↵2 Abbreviations used in this paper: CysLT, cysteinyl leukotriene; LT, leukotriene; LTRA, LTR antagonist; HFL-1, human fetal lung fibroblast; CT, threshold cycle; AM, alveolar macrophage; SMC, smooth muscle cell; BAL, bronchoalveolar lavage; EGF, epidermal growth factor. Lewis, R. A., K. F. Austen, R. J. Soberman. 1990. Leukotrienes and other products of the 5-lipoxygenase pathway: biochemistry and relation to pathobiology in human diseases. N. Engl. J. Med. 323:645. Dahlen, S. E., P. Hedqvist, S. Hammarstrom, B. Samuelsson. 1980. Leukotrienes are potent constrictors of human bronchi. Nature 288:484. Piper, P. J.. 1984. Formation and actions of leukotrienes. Physiol. Rev. 64:744. Piper, P. J., D. M. Conroy, J. F. Costello, J. M. Evans, C. P. Green, J. F. Price, A. P. Sampson, D. A. Spencer. 1991. Leukotrienes and inflammatory lung disease. Ann. NY Acad. Sci. 629:112. Laitinen, L. A., A. Laitinen, T. Haahtela, V. Vilkka, B. W. Spur, T. H. Lee. 1993. Leukotriene E4 and granulocytic infiltration into asthmatic airways. Lancet 341:989. Diamant, Z., J. T. Hiltermann, E. L. van Rensen, P. M. Callenbach, M. Veselic-Charvat, H. van der Veen, J. K. Sont, P. J. Sterk. 1997. The effect of inhaled leukotriene D4 and methacholine on sputum cell differentials in asthma. Am. J. Respir. Crit. Care Med. 155:1247. Pizzichini, E., J. A. Leff, T. F. Reiss, L. Hendeles, L. P. Boulet, L. X. Wei, A. E. Efthimiadis, J. Zhang, F. E. Hargreave. 1999. Montelukast reduces airway eosinophilic inflammation in asthma: a randomized, controlled trial. Eur. Respir. J. 14:12. Yamauchi, K., Y. Tanifuji, L. H. Pan, T. Yoshida, S. Sakurai, S. Goto, S. Kuroda, H. Kobayashi, H. Inoue. 2001. Effects of pranlukast, a leukotriene receptor antagonist, on airway inflammation in mild asthmatics. J. Asthma 38:51. Spada, C. S., A. H. Krauss, A. L. Nieves, D. F. Woodward. 1997. Effects of leukotrienes B4 (LTB4) and D4 (LTD4) on motility of isolated normodense human eosinophils and neutrophils. Adv. Exp. Med. Biol. 400B:699. Virchow, J. C., Jr, S. Faehndrich, C. Nassenstein, S. Bock, H. Matthys, W. Luttmann. 2001. Effect of a specific cysteinyl leukotriene-receptor 1-antagonist (montelukast) on the transmigration of eosinophils across human umbilical vein endothelial cells. Clin. Exp. Allergy 31:836. Tohda, Y., H. Nakahara, H. Kubo, R. Haraguchi, M. Fukuoka, S. Nakajima. 1999. Effects of ONO-1078 (pranlukast) on cytokine production in peripheral blood mononuclear cells of patients with bronchial asthma. Clin. Exp. Allergy 29:1532. Brown, J. R., J. Kleimberg, M. Marini, G. Sun, A. Bellini, S. Mattoli. 1998. Kinetics of eotaxin expression and its relationship to eosinophil accumulation and activation in bronchial biopsies and bronchoalveolar lavage (BAL) of asthmatic patients after allergen inhalation. Clin. Exp. Immunol. 114:137. Bartels, J., C. Schluter, E. Richter, N. Noso, R. Kulke, E. Christophers, J. M. Schroder. 1996. Human dermal fibroblasts express eotaxin: molecular cloning, mRNA expression, and identification of eotaxin sequence variants. Biochim. Biophys. Acta 225:1045. Mochizuki, M., J. Bartels, A. I. Mallet, E. Christophers, J. M. Schroder. 1998. IL-4 induces eotaxin: a possible mechanism of selective eosinophil recruitment in helminth infection and atopy. J. Immunol. 160:60. Miyamasu, M., T. Nakajima, Y. Misaki, S. Izumi, N. Tsuno, T. Kasahara, K. Yamamoto, Y. Morita, K. Hirai. 1999. Dermal fibroblasts represent a potent major source of human eotaxin: in vitro production and cytokine-mediated regulation. Cytokine 11:751. Nonaka, M., R. Pawankar, F. Saji, T. Yagi. 1999. Eotaxin synthesis by nasal polyp fibroblasts. Acta Otolaryngol. 119:816. Hoeck, J., M. Woisetschlager. 2001. STAT6 mediates eotaxin-1 expression in IL-4 or TNF-α-induced fibroblasts. J. Immunol. 166:4507. Lynch, K. R., G. P. O’Neill, Q. Liu, D. S. Im, N. Sawyer, K. M. Metters, N. Coulombe, M. Abramovitz, D. J. Figueroa, Z. Zeng, et al 1999. Characterization of the human cysteinyl leukotriene CysLT1 receptor. Nature 399:789. Thivierge, M., M. Doty, J. Johnson, J. Stankova, M. Rola-Pleszczynski. 2000. IL-5 up-regulates cysteinyl leukotriene 1 receptor expression in HL-60 cells differentiated into eosinophils. J. Immunol. 165:5221. Thivierge, M., J. Stankova, M. Rola-Pleszczynski. 2001. IL-13 and IL-4 up-regulate cysteinyl leukotriene 1 receptor expression in human monocytes and macrophages. J. Immunol. 167:2855. Hansel, T. T., I. J. De Vries, T. Iff, S. Rihs, M. Wandzilak, S. Betz, K. Blaser, C. Walker. 1991. An improved immunomagnetic procedure for the isolation of highly purified human blood eosinophils. J. Immunol. Methods 145:105. Bautz, F., C. Denzlinger, L. Kanz, R. Mohle. 2001. Chemotaxis and transendothelial migration of CD34+ hematopoietic progenitor cells induced by the inflammatory mediator leukotriene D4 are mediated by the 7-transmembrane receptor CysLT1. Blood 97:3433. Figueroa, D. J., R. M. Breyer, S. K. Defoe, S. Kargman, B. L. Daugherty, K. Waldburger, Q. Liu, M. Clements, Z. Zeng, G. P. O’Neill, et al 2001. Expression of the cysteinyl leukotriene 1 receptor in normal human lung and peripheral blood leukocytes. Am. J. Respir. Crit. Care Med. 163:226. Humbert, M., S. R. Durham, P. Kimmitt, N. Powell, B. Assoufi, R. Pfister, G. Menz, A. B. Kay, C. J. Corrigan. 1997. Elevated expression of messenger ribonucleic acid encoding IL-13 in the bronchial mucosa of atopic and nonatopic subjects with asthma. J. Allergy Clin. Immunol. 99:657. Gauvreau, G. M., K. N. Parameswaran, R. N. Watson, P. M. O’Byrne. 2001. Inhaled leukotriene E4, but not leukotriene D4, increased airway inflammatory cells in subjects with atopic asthma. Am. J. Respir. Crit. Care Med. 164:1495. Kawada, N., T. Yamada, Y. Takahashi, S. Tokuoka, T. Masuda, H. Tanaka, H. Nagai. 2001. The effect of leukotriene D4 inhalation on the antigen-induced airway hyperresponsiveness and inflammation in 5-lipoxygenase gene-deficient mice. Int. Arch. Allergy Immunol. 126:309. Griffiths-Johnson, D. A., P. D. Collins, A. G. Rossi, P. J. Jose, T. J. Williams. 1993. The chemokine, eotaxin, activates guinea-pig eosinophils in vitro and causes their accumulation into the lung in vivo. Biochim. Biophys. Acta 197:1167. Jose, P. J., D. A. Griffiths-Johnson, P. D. Collins, D. T. Walsh, R. Moqbel, N. F. Totty, O. Truong, J. J. Hsuan, T. J. Williams. 1994. Eotaxin: a potent eosinophil chemoattractant cytokine detected in a guinea pig model of allergic airways inflammation. J. Exp. Med. 179:881. Garcia-Zepeda, E. A., M. E. Rothenberg, R. T. Ownbey, J. Celestin, P. Leder, A. D. Luster. 1996. Human eotaxin is a specific chemoattractant for eosinophil cells and provides a new mechanism to explain tissue eosinophilia. Nat. Med. 2:449. Ponath, P. D., S. Qin, D. J. Ringler, I. Clark-Lewis, J. Wang, N. Kassam, H. Smith, X. Shi, J. A. Gonzalo, W. Newman, et al 1996. Cloning of the human eosinophil chemoattractant, eotaxin: expression, receptor binding, and functional properties suggest a mechanism for the selective recruitment of eosinophils. J. Clin. Invest. 97:604. Mattoli, S., M. A. Stacey, G. Sun, A. Bellini, M. Marini. 1997. Eotaxin expression and eosinophilic inflammation in asthma. Biochim. Biophys. Acta 236:299. Lamkhioued, B., P. M. Renzi, S. Abi-Younes, E. A. Garcia-Zepada, Z. Allakhverdi, O. Ghaffar, M. D. Rothenberg, A. D. Luster, Q. Hamid. 1997. Increased expression of eotaxin in bronchoalveolar lavage and airways of asthmatics contributes to the chemotaxis of eosinophils to the site of inflammation. J. Immunol. 159:4593. Ying, S., D. S. Robinson, Q. Meng, J. Rottman, R. Kennedy, D. J. Ringler, C. R. Mackay, B. L. Daugherty, M. S. Springer, S. R. Durham, et al 1997. Enhanced expression of eotaxin and CCR3 mRNA and protein in atopic asthma: association with airway hyperresponsiveness and predominant co-localization of eotaxin mRNA to bronchial epithelial and endothelial cells. Eur. J. Immunol. 27:3507. Terada, N., N. Hamano, T. Nomura, T. Numata, K. Hirai, T. Nakajima, H. Yamada, O. Yoshie, T. Ikeda-Ito, A. Konno. 2000. Interleukin-13 and tumour necrosis factor-α synergistically induce eotaxin production in human nasal fibroblasts. Clin. Exp. Allergy 30:348. Sato, E., D. K. Nelson, S. Koyama, J. C. Hoyt, R. A. Robbins. 2000. Bradykinin stimulates eotaxin production by a human lung fibroblast cell line. J. Allergy Clin. Immunol. 106:117. Wenzel, S. E., J. B. Trudeau, S. Barnes, X. Zhou, M. Cundall, J. Y. Westcott, K. McCord, H. W. Chu. 2002. TGF-β and IL-13 synergistically increase eotaxin-1 production in human airway fibroblasts. J. Immunol. 169:4613. Li, L., Y. Xia, A. Nguyen, Y. H. Lai, L. Feng, T. R. Mosmann, D. Lo. 1999. Effects of Th2 cytokines on chemokine expression in the lung: IL-13 potently induces eotaxin expression by airway epithelial cells. J. Immunol. 162:2477. Zhu, Z., R. J. Homer, Z. Wang, Q. Chen, G. P. Geba, J. Wang, Y. Zhang, J. A. Elias. 1999. Pulmonary expression of interleukin-13 causes inflammation, mucus hypersecretion, subepithelial fibrosis, physiologic abnormalities, and eotaxin production. J. Clin. Invest. 103:779. Matsukura, S., C. Stellato, J. R. Plitt, C. Bickel, K. Miura, S. N. Georas, V. Casolaro, R. P. Schleimer. 1999. Activation of eotaxin gene transcription by NF-κB and STAT6 in human airway epithelial cells. J. Immunol. 163:6876. Panettieri, R. A., E. M. Tan, V. Ciocca, M. A. Luttmann, T. B. Leonard, D. W. Hay. 1998. Effects of LTD4 on human airway smooth muscle cell proliferation, matrix expression, and contraction in vitro: differential sensitivity to cysteinyl leukotriene receptor antagonists. Am. J. Respir. Cell Mol. Biol. 19:453. Underwood, D. C., R. R. Osborn, S. J. Newsholme, T. J. Torphy, D. W. Hay. 1996. Persistent airway eosinophilia after leukotriene (LT) D4 administration in the guinea pig: modulation by the LTD4 receptor antagonist, pranlukast, or an interleukin-5 monoclonal antibody. Am. J. Respir. Crit. Care Med. 154:850. Nakamura, Y., M. Hoshino, J. J. Sim, K. Ishii, K. Hosaka, T. Sakamoto. 1998. Effect of the leukotriene receptor antagonist pranlukast on cellular infiltration in the bronchial mucosa of patients with asthma. Thorax 53:835.